When an individual is diagnosed with type 2 diabetes certain requirements must be present. A person’s body does not produce enough insulin to keep glucose levels under control or the insulin that is formed is not used properly by the body. Proper diet and exercise is important to maintain the blood sugar levels at a safe range. However, when this is not enough, Micronase tablets may be prescribed. An individual that does not need insulin injections can use this medication to control and maintain the insulin produced from their pancreas. For this type of medication to work correctly, an individual must follow a diet and exercise regiment. Alone, this medication will not help the system. The Micronase tablets come in 1.2mg, 2.5mg as well as 5mg. The doctor will prescribe the correct dose and strength for an individual’s needs. This depends on the amount of insulin that is produced as well as the breakdown of the glucose levels inside the body. There are several key pieces of information an individual will need to know before taking this medication. The physician will discuss with the patient the correct procedures to follow. Any questions or concerns must be asked before the medication is taken. If there are other medical conditions or medications that are currently being taken, the doctor must know immediately. This can cause a diverse affect on an individual’s system. An individual should take this medication as prescribed. Usually, it is taken at breakfast each day. The Micronase medication should be taken the same time of day, everyday. If more than a once-a-day regiment is required, an individual should allow 12 hours between each dose. Never miss a dose. Everyone is forgetful now and again. If a dose is missed, take it as soon as remembered, with food. Never take more than 1 pill at a time. Any medical conditions previous to the diabetes should be discussed with the physician. An individual with certain heart or system problems may not be allowed to take the Micronase medication. It is vital that the correct tests are done to ensure a healthy body. An individual that has other health issues that have not been diagnosed could cause massive health problems when this medication is taken. An individual will need to talk with their doctor if any other medication is being consumed. This can include over-the-counter pills or vitamins as well as minerals. Mixing of any medication can reduce the risks of additional problems that may be present. It is vital to communicate with the doctor. 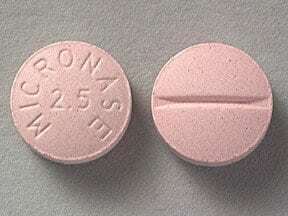 Side effects when taking Micronase tablets are extremely rare. However, cases are present at times. After starting the treatment, make notes of any odd occurrences that a person has never experienced before. Mild reactions are fairly common in the first few days, but more serious issues can arise. Any concerns or questions need to be addressed right away to protect an individual’s health and well being. An individual may develop mild causes of heartburn, swelling or feeling sick to the stomach. These symptoms are fairly common and usually leave within a few days of the on-going treatment. Low blood sugar problems may develop. The Micronase medication is designed to assist the body in producing more insulin. If this medication is taken too often or an individual is not eating properly, diverse effects may be present. Testing the glucose levels often can assist in keeping the levels in a safe range. When low blood sugar is present eat a hard piece of candy and test again. If the glucose levels are still in an unsafe range, contact a medical care provider right away. An allergic reaction is extremely rare with this medication. However, if allergic reactions have happened in the past with certain medication, explain this to the doctor. The symptoms could include a large rash, difficulty in breathing or fever. Contact a physician right away if any of these occur while taking the Micronase treatment.